James Fallows joins the small circle of Western journalists to have made the journey to Foxconn . He shouldn't be so surprised at what he found there. Foxconn. The word no doubt evokes images of miserable proles, and the company has become a Dickensian symbol of the laboring masses in China that produce everything that makes the 21st century the 21st century. 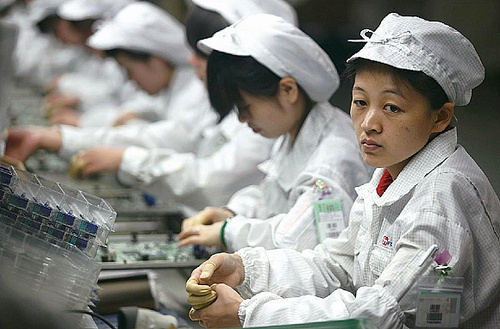 What the Nike sweatshop was to the 1990s, Foxconn has become to the 2010s. But if you dig a little deeper, even on Google, the picture becomes slightly more complicated: There are soccer fields and cafes amidst the images of workers assembling iPhones and iPads. Workers complain about bad food and not being able to work as many hours as they'd like. So I'm somewhat surprised that James Fallows, super-international correspondent for The Atlantic who's spent a lot of time reporting abroad is, well, surprised by what he found at Foxconn. Not because he found previously unreported egregious labor violations or inhumane conditions, but because he found a bunch of people acting rather normal. I am always surprised by things in China, but this day was at the more-surprising-than-usual end of the spectrum. In the days to come, I will share a series of photos I was able to take on the campus. I will start now, before completing my article, with just a few that set the general mood. They like watching TVs! and And they drink coffee and put money in the bank. These are the young people building your smartphones and computers. Or, this kind of scene at lunch hour, with a bunch of employees clustering around a HD big-screen TV being offered at special discount. This is a main street on the campus near a central cafeteria and many shops, banks, coffee bars, and so on.